Posts tagged "Interview with a bone reader"
Khi Armand is an author, rootworker, and diviner. He has written two books – Deliverance: Hoodoo Spells of Uncrossing, Healing, and Protection, and Clearing Spaces: Inspirational Techniques to Heal Your Home, scheduled for release January 2017. My introduction to bone reading actually happened during my first visit to the Lucky Mojo Curio Company in Forestville, CA. I just happened to catch the proprietor, ms. catherine yronwode, as she was working that day. We sat down on the ground and she gave me a short impromptu palm reading. She said that based on my aptitude for performance (as seen in my palm) I’d be particularly good at bone reading, and that they had just started stocking sets in the store. I picked one up that day. I’ve been reading them for about 4 years now. Did you have any teachers? Who? Well, you’ve been one of them! There was a time when my spirits were really nudging me to work more with my bones and you provided me with a wonderful session that went far in boosting my confidence with them. Then there’s been ms. catherine yronwode. And I’d be loath to not mention your incredible book, Bones, Shells, & Curios. Some of the bone pieces I started out with have been replaced by pieces that feel more true to me, coming from dice sets, natural history stores, and found objects and tchotchkes. At the moment, there are 47 pieces in my bone set. I imagine that it will be in flux for the rest of my life – I’m always adding pieces and, sometimes, removing ones that no longer feel helpful as my practice evolves. Do you use a special cloth or reading surface? I do. I have a small goat skin for reading bones on. Yes, I tend to do a fair amount of re-consecrating as I feel the need arises or as I add new pieces to my bone set. Smoking my pieces in an appropriate incense blend is how I usually accomplish this. I do cleanse my bones – my own tend to like to being sprayed with floral waters and perfumes between sessions. Do you do anything special before a reading – invocations, prayers, etc? I do – because my bone set has so many different pieces in it that speak to so many different aspects of my practice and the different traditions I’m a part of, I like to affirm both my and my clients’ connection to all things, including primordial elemental forces, before starting a bone reading. In a way, all creation is welcome at the table to speak on behalf of this person’s destiny and current experience of reality as represented by so many different bones, stones, metals, and other objects present in my set. It’s the most shamanic of my mechanical divinatory tools – that is, those that actually require physical movement or manipulation. How do you think the bones work? Ancestors? Spirits? Etc. tic. Something about throwing them triggers immediate spirit contact for me so, although I’m reading the bones on my skin, talking to them and seeing their placement in relation to one another, I’m also receiving a great amount information from my helping spirits. I have a female African ancestor who is particularly drawn to my bone reading work and we make a great team. I tend to throw all of my bones. I’ve given myself very few bone readings over the years as I tend toward tarot and shamanic trance work when investigating personal issues, which I generally like to do piecemeal, like exploring and repairing part of an airplane mid-flight. My bone readings, though they can clue into specific information, tend to be very broad in scope, like a 72-card tarot layout, and it’s very rare for me to seek out something like that for myself. I haven’t had any requests but I’d certainly be open to it. One would be to get your book, Bones, Shells, and Curios, and another would be to get readings from many different reputable readers. Seeing different peoples’ styles and interpretation methods can be tremendous support to one’s own practice. Chas Bogan is a key figure in my bone reading journey. 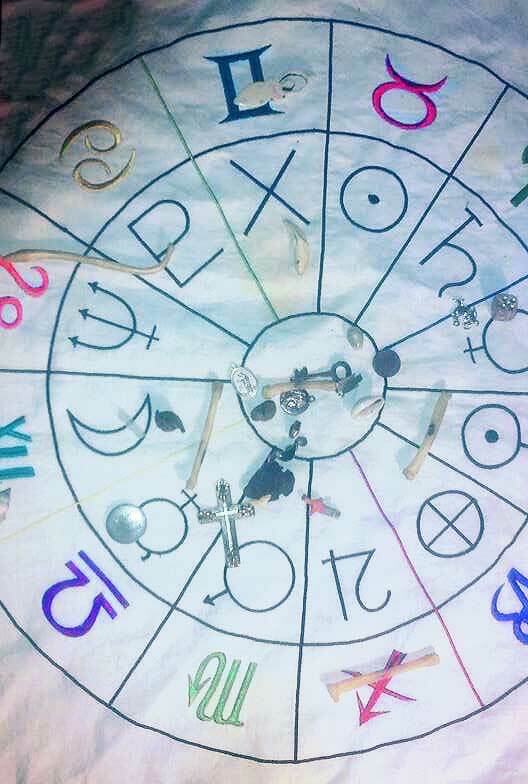 He was the first person to give me a bone reading and his reading was so accurate, and his set so beautiful, that I knew I had to try this divination method myself. I bought a starter set of bones the next day and now, here we are. Chas is the co-owner of The Mystic Dream, a metaphysical shop in Walnut Creek California. He is a talented bone reader, an amazing artist, and a good friend. · How did you get started in bone reading? I have a friend who is a medium, who brings a bag of trinkets to her sessions. 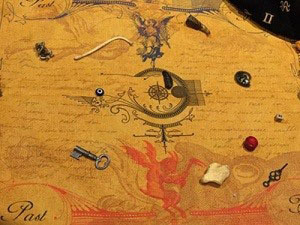 When the spirits have problems communicating she will have them choose a curio and expand on its meaning. I began putting items together for that purpose, and realized I had all the elements of a bone reading kit. · How long have you been reading bones? I believe it was around 2010 when I started. · Did you have any teachers? Who? I relied mostly on my spirit guides and the pieces themselves to educate me initially. I also joined various groups and sought out other readers, and learned plenty of tricks from them. Cat Yronwode’s book Throwing The Bones was highly influential. I encouraged several of my friends to get into the practice so that I could in turn learn from them. · Where did you get your bone pieces? There was a shop in Albany called The Bone Room that I frequented, but regrettably it is gone now. * I’ve gotten some of my favorite pieces from Lucky Mojo as well. Since my friends know that I do bone throwing I am frequently gifted bones. · How many bones in your set? 38· How long did it take you to put your set together? I built to that number quickly, but with some pieces that were less than ideal and were later switched for others. Since I also read Lenormand, I patterned my initial set after that system.· Are you still adding pieces? I am not expanding on my current set, however as things deteriorate I switch them out. Some items change their meanings subtly over time, so I need to make adjustments occasionally. · Do you use a special cloth or reading surface? I have an old, shallow wooden box that I favor, as it allows me to throw them on a table without the fear of pieces falling to the ground. Interestingly, I have designed some reading cloths, and although I have used them well, I always default to my old wooden box. · Did you do any consecration ceremony for them? I sometimes will rub some oils or Hoyt’s cologne on a piece to feed it, but that is about it. · Do you cleanse them? If I have used them in a reading that has left me feeling dirty or sticky, which sometimes happens, then yes, I will cleanse them, most often by spreading the pieces out and blowing white sage smoke over them. · Do you do anything special before a reading – invocations, prayers, etc? I have a simple way of connecting with Spirit that is internal. Really I just focus my attention away from the mundane and towards the presence of my guides so that they may speak to me. If I feel that the person I am reading for will benefit by beginning with a prayer, which many find soothing, then I will pray accordingly. · How do you think the bones work? Ancestors? Spirits? Etc. I definitely rely on my guides to help me interpret the bones. Each bone, or curio that I use has it’s own identity though, it’s own indwelling spirit that has something definitive to say. I have tried on occasion to find a bone to represent a certain quality, but there is more a play here than creating a symbolic system, since each bone defines itself despite what I might try to establish. · Do you throw all of your bones or some subset? I usually throw them all, however I will sometimes have a client reach into my bag and pull out three items, one for the past, the present, and the future. · Do you read for yourself? Some people feel that they do not do well reading for themselves. I do not read for myself. I found that I would always question those readings, and that in doubting them I was doing damage to my faith in my abilities. · Do you teach bone reading? Informally, yes, but not to the extent of doing public classes as I do with other things. · What advice do you have for bone readers just starting out? You want to create a set that acts as a community, where each piece has its own voice. Some pieces are mouthier than others. For instance, I find that Raccoon Baculums tend to be the mansplainers of the bone world, getting all up into every reading even when they have nothing relevant to say. When dealing with such a bone you can either treat him like you would that guy at the party who won’t shut up and ignore much of what he has to say, or you can invite someone to take his place, someone who knows only to talk when the subject is something he has knowledge of. I find that approaching each piece as an individual with it’s own quirks and interests is key, as is knowing how well they will interact together. · Do you read professionally? I do read bones professionally, along with Tarot and Lenormand. I book according to time, not modality, so a person can book for a half hour and choose what type of reading they want once we begin. 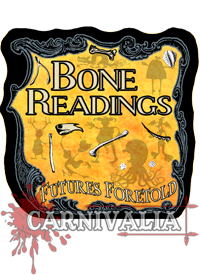 Shaun Laveau is a young bone reader living in Omaha Nebraska. He is an ardent student of African American folklore, folkways, and folk magic with an eye towards ensuring their preservation, and he reads the bones professionally at festivals and at other venues. I actually came to bone reading from a reading dice. I had a big interest in learning to read the bones. I didn’t know where to start, but I had heard that reading dice was very similar. I started reading dice, and then evolved into bone reading. I never had any formal training or lessons on bone readings. A person I always credit as a teacher is Michele Jackson because her book Bones, Shells, and Curios really helped me get started and get a feeling for my style of reading bones. I was originally gifted a set of bones by a local worker who gave me four raccoon bones, and a tiny skull piece. Yes. I feel like I’ll have a good collection when I reach 66 or 70. Yes I do. It’s actually a mat with planetary symbols and Astrology signs on it. For my pieces whenever I get a new one I take it to my ancestors and tell them what it means to me. Then I meditate with it in my hand to put the energy of its meaning into it. For my mat I dipped it in Holy Water and then allowed it to air dry. It is all depends. If I am reading for myself I do a little prayer to ask my ancestors to speak clearly to me and ask that all my spirits be present to offer their messages too. Sometimes my clients want to do a prayer before the first toss and sometimes they don’t. I believe that your ancestors and your spirits are what come through to help with the readings and offer whatever wisdom may be needed. Yes I do, but sometimes I do go to other people for readings to maybe confirm my feelings or get more clarity on the situation. No, I don’t feel I have the experience under me to teach others yet. Make sure that you know yourself and have a working relationship with your ancestors and spirits before you start reading bones. Unkle Destiny has been hosting a YouTube Channel featuring his bone readings for several years now. He does an annual reading and a monthly reading for the public. * How did you get started in bone reading? Bone reading came out of my studies in Hoodoo (African-American spiritual arts). My teacher at the time told me that he foresaw me reading the bones, and that the bones would come to me when it was time. I read a number of sources on the subject from around the world on bone reading to try to understand it more. Eventually, a situation happened that lead to the process of me acquiring the bones I use. After acquiring them, it took some time to understand how to work with them. * How long have you been reading bones? Let’s see, I started the YouTube channel in 2012. So I started reading for friends about 2011. I acquired the bones in 2010. So at this point about 6 years now. * Did you have any teachers? Who? As I said before my Teacher in Hoodoo, Papa Ce. Had informed me that the bones were coming. With his help, we selected the bones to use in reading. As I said earlier, I read a number of sources on the subject of bone reading to try to understand it more, which I found to be more academic. But from that point on, learning how to throw them, what their meanings are, and whether anything should be added (such as the copper and quartz) was done through my relationship and work with spirit and the ancestors. So my teachers, if you will, were Papa Ce, Spirits, and Ancestors. * Where did you get your bone pieces? Oh, that is a story all its own, and not for the faint of heart. Let me first say, I am not one to see any animal harmed. This is something I made clear to both Papa Ce and to Spirits. Which is why I felt it necessary to say in my YouTube channel that “No animals were harmed in collecting the bones I use.” So the source of the bones was something that had to be dead before hand. So following some informational dreams, and my Hoodoo training, I was on the lookout for a certain source of bones. I eventually encountered road kill that fit. I then collected it and took it home. Then I began the multi-week process of harvesting, cleaning, and preparing the bones for reading. * How many bones in your set? There were at least 15 to start. A couple really small pieces were lost. Since then, Spirit has led to the addition of the Copper and Quartz pieces. With these additions I was back at 15. * How long did it take you to put your set together? I added the Quartz piece last year. The Cooper piece was the year before that. Otherwise, all the bones are from when I collected the animal originally. * Are you still adding pieces? I’m open to it. But a new piece is only added when spirit feels a that a new piece is needed and it depends on what that piece can teach. * Do you use a special cloth or reading surface? I use a piece of red felt. 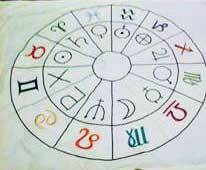 I’ve seen and known others who have their reading surface marked with set indicators to help with meanings. I don’t have that on my reading surface. The lack of those markings has never been a problem when reading the bones for me. Why that hasn’t been a problem, I think lies in the nature of what is being asked when a reading is required. Readings are done for many reasons. The energies around those reasons will differ. By having and depending on the markings it lessens the likelihood that the other much more subtle energies at play be noticed. Those energies have the power to undermine, drive, or shift a situation if you don’t know to account for to them. I also find that how Spirits and the Ancestors answer doesn’t lend itself to having the marking system. * Did you do any consecration ceremony for them? After I finished assembling the bones. I took them to my altars and asked the Spirits and Ancestors to bless and infuse the bones for the work to come. Then I left them on my altar for about 6-8 months before the impulse came to start working with them. * Do you cleanse them? I’m the only one who touches the bones. The needs and act of cleansing the bones is different because of that. * Do you do anything special before a reading – invocations, prayers, etc? I have a pray/invocation I say when preparing the bones for a reading. * How do you think the bones work? Ancestors? Spirits? Etc. Relationship. I’m going to leave it with that. * Do you throw all of your bones or some subset? * Do you read for yourself? Some people feel that they do not do well reading for themselves. Yes, I do sometimes. My view on reading for self is that there will be areas which can’t be seen, though not due to lack of ability. It’s due more to the nature of the question/decision being asked. Those areas are ones where change has to happen more by faith, than reason. Those areas are about our journey along the path of life. If we knew every secret about what life was sending us, we wouldn’t face the challenges. How then could we help and relate to those who come to us for readings? * Do you teach bone reading? Not at this time. I’ve been asked. * What advice do you have for bone readers just starting out? My advice? What/ how is your relationship with Spirit and the Ancestors? Start from there. * Do you read professionally? *How can people contact you? Ambrozine LeGare is a poet, an actress, a performance artist, a priestess, and a diviner. She is probably best known for her long-running, poetry themed radio show Liquid Libations. I got started in bone reading quite by chance. I was at my soon-to-be Godfather’s birthday party and he took out his bone set to give a reading to one of the guests in attendance. This was my first time seeing anyone throw bones. When he threw the bones for his guest, I was able to read them. I was hooked on bone reading from that moment on. I have been reading bones for three years. Surprisingly, I have yet to have any formal teachers to learn how to read bones. I have, however, been inspired by and have learned from books written by Michele Jackson, Catherine Yronwood, and Claire O’Neill. I also seek out any books and videos about the history of bone reading. I typically buy, or I am gifted bones. I also “find” pieces during my travels. At the moment, I have 30 different types of bones in my set. · How long did it take you to put your set together? It took me the better part of a year to put together what I like to call my “core” set of pieces that I use in each reading. · Are you still adding pieces? Yes. I think that I will be adding and removing pieces for many years to come. Yes I do. I use a special cloth from South Africa that was blessed and gifted to me by a Priest. I do have a consecration ceremony for my bone set. I also have a special day that I set aside to feed and renew them. I certainly do. Keeping all of my divination tools clean is a must in my divinatory practice. I do a cleanse with incense at the close of reading sessions and a bigger more thorough cleansing once a month (more often if necessary). In my divinatory practice, I give thanks, pray and do invocations before starting any reading session. Depending upon the person, the bones can work a number of ways. For me, the bones work via a combination of my own Spirits (ancestors and spirit court) and the spirits of the person that I am reading for. Typically, I will throw a subset of my bones. Not every reading will call for the full set to be thrown. For readings that look at time periods that range from 6 months to a year and/or a full life reading, I may be guided to throw the entire set. I do read for myself but, if I feel that I need an unbiased look at a personal situation I will have someone else read for me. This is a yes and no answer. While I do not teach formally, I will teach what I have learned and do my best to educate clients about the bones that they are looking at. I feel that it is important for those that receive bone readings to have at the very least, a basic understanding of what they are looking at and are being told. The best advice that I can give to bone readers just starting out is to trust your intuition. Doubt of any kind can lead one not giving an accurate reading. Take the time to learn about the history of bone reading, do not stop at just reading one or two books and taking a class. Bond with your bone set and “listen” to what each piece has to say. Readings done via Email, Skype, Google Hangouts, In-Person, and Telephone. Iyanifa Ayele Kumari is an author, a healer, a priestess, and a diviner. She was among the first bone readers I met when I was starting out and we had many good conversations about the bones, and about life. She has been reading the bones for many years and I am grateful to her for sharing her long experience here. When I was 5 or 6, I had a dream of talking bones on a deep purple rug. It’s my first memory and for years, I dreamed of bones in one form or another. I began divining when I was 18 or so and my love of divination turned to bones when I first saw a Sangoma give a reading. It resonated with me. I began collecting them and intuitively put some together. Later, a friend who was an Akan priest began giving me more details and helped me developed my system more. Finally, I had an opportunity to train with a Nganga and that rounded out my training. I am also an Ifa and Oya Priestess so I included aspects of Ifa and Orisha into the bones too. For instance, I use Opele pods which are traditionally a part of a divination chain in our tradition. These help me to determine a specific Odu signature in the reading, and each Orisha has a specific bone. Oya is a force of nature that particularly governs the ancestral realm so I find working with bones enhances my Oya work. I’ve been reading bones for about 15 years. Adenseni Kwame is my main teacher. He is an Akan priest. My ancestors also teach me. Some bought. Some from ritual offerings. Some from food. I also incorporate stones, seeds, metal, and shells into my bone set. It developed over about 4-5 years. Yes… as I need evolve it. But I also retire pieces too. Recently I added a technology bone to reflect modern times, computers, phones, devices, etc. Yes. I use a wide basket and a cloth that maps out the cosmology of the world. Yes. I consecrated them like the Akan shrine does…with herbs and spiritual baths. Yes. Smudge, earth and water. Do you do anything special before doing a reading – invocations, prayers, etc? Yes. I invoke the ancestors and Esu in my readings. They are an ancestral oracle traditionally. I have specific ancestors that communicate through them. All of them… but I may not read them all in a reading. Yes, I do but I am also open to receiving readings from others. When I read myself, I do it in the third person, as if I am reading someone else. I find that helps me to detach. Yes. I do. My bone reading course will be on Asheacademy.com in a month or so. Do self-development first. Gain a wider perspective of the world.. The clearer you are and more connected with Spirit you are the better your reading will be. Too many people want to be fast food readers and not take the time to master their craft. Along with predicting the future, you should also be able to read remedies for situations. That takes time to learn. I would also say this is an ancient art – connect with your ancestors to help you.